Krishna Pushkaralu, also called 'the Kumbh Mela of South India' is held once in 12 years across several places in Maharashtra, Karnataka, Telangana and Andhra Pradesh along the river Krishna. This time, the event was held in Andhra Pradesh and gained traction since it became an official program, with state government involvement on a major scale in its administration, arrangements and spending. This 12 days event was held from Aug. 12 to Aug. 23, 2016. According to an official estimate, close to 20 million people took holy dips in the Krishna in Andhra Pradesh, including 1.5 million on the last day. Divya Jyoti Jagrati Sansthan (DJJS) also marked its presence by putting up a stall at Indira Gandhi Stadium, Vijaywada near Krishna River. DJJS, Vijaywada branch with the help of Chennai branch organized the stall. Through this stall, spiritual publications of Sansthan were distributed to the visitors at the stall, Ghats and other areas of the mela. Many people enquired about the Sansthan and its activities. Swami Pradeepanand Ji from Chennai branch explained about DJJS, its mission and vision to the visitors. 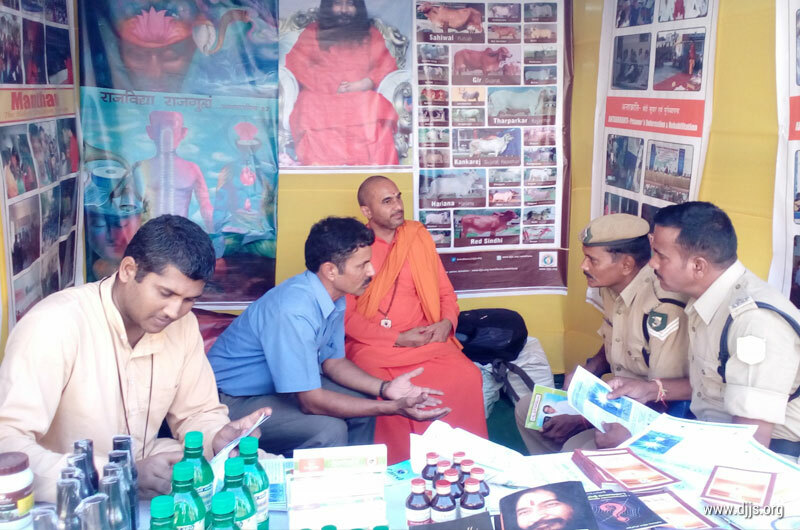 Volunteers from Vijaywada and outstation cities like Bengaluru, Hyderabad, Guntur and Kodad enthusiastically reached to the stall and ghats to give the message of Brahm Gyan (divine knowledge) using different literature like leaflets, pamphlets, Akhand Gyan magazine and booklets. The officials of Pushkaralu warmly received the message of Sansthan and expressed their desire to see DJJS activities in Vijaywada. People from various spheres like Govt. officials, corporate employees, NRIs, Police department etc. received the message at a grand scale. Andhra Pradesh Chief Minister N. Chandrababu Naidu, Union Ministers M. Venkaiah Naidu and Suresh Prabhu, Ganapathi Sachchidananda Swamy of Avadhoota Datta Peetham (Mysuru), and Olympic medalist P.V. Sindhu and her coach P. Gopi Chand were special guests at Krishna Pushkaralu-2016.